The fantastic tea towels featuring self-portraits of all the children are selling like hot cakes and there are only 25 left!! Thank you so much to everyone who has purchased them. If you would still like to order one (or more - they make excellent Christmas presents for grandparents ;-)) please don't delay. 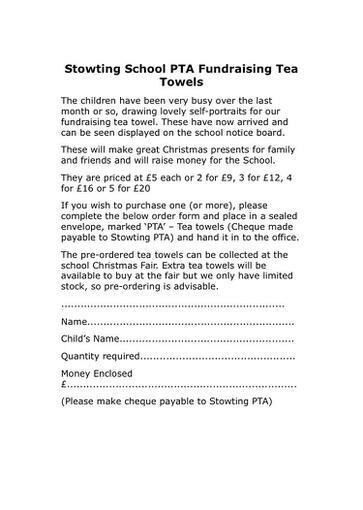 Either complete the attached flyer, contact Suzi McCully direct, or put an envelope into the correspondence box in the office clearly marked PTA, stating name, quantity required and payment inside.